We’ve known for a while that the BBC and Sky Atlantic were putting together a story about the life and times of Ian Fleming, the spirited writer of the James Bond novels who actually wheeled and dealed in an intelligence unit and also drank his fair share of martinis. In the States, Fleming: The Man Who Would Be Bond will air on BBC America, but the series won’t hit the network until the winter of 2014. 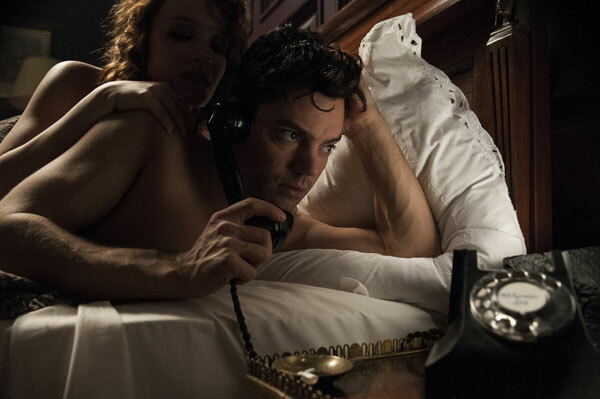 Regardless, if you have been looking forward to seeing how Dominic Cooper would look in the role, the network has graciously put out some production stills highlighting the upcoming min-seriesi. The top image takes a look at our main character in a rather Bond-like setting requiring a suit and some suave dance moves. Cooper’s Fleming is busy getting up close and personal with Sherlock actress Lara Pulver, who will play Ann in the series (although I daresay that Benedict Cumberbatch got the better end of the deal with his scenes with Pulver). Ann likely refers to Ann Geraldine Charteris, who had a great affair with Fleming before leaving her husband to marry him. Other additions to the cast include Annabel Wallis as Muriel, Pip Torrens as Esmond, and Camilla Rutherford as Loeila. The second image gives fans even more reasons to correlate the late, great Fleming with the larger-than-life spy character he created. This time we see Fleming in bed with a lovely lady whose face is covered. He’s on the telephone and since it’s late at night, it’s no doubt important business. Cooper is far more handsome than the real-life Fleming, but we’ll have to wait and see if the actor manages to pull off the late author's beguiling charm. Additionally, if you were hoping for a little more action from Fleming, the BBC and Sky Atlantic have put out the first trailer for the series, which takes the titular character out of the bedroom and the dance hall and into some crazy real-life spy moments. BBC America hasn’t set an exact premiere date for the four part mini-series, yet, but filming did begin early in 2013 for the aforementioned 2014 premiere. Keep your eyes peeled for new trailers and news in the coming months.